Hi friends! This week we received a complimentary Try the World box (Japan) to review for the blog, and I think this might be one of my favourite review posts ever. Luke, Eve and I had so much fun going through the box, learning about each item, trying them out, and picking our favourites. It was both a great educational experience and a wonderful way to have fun together. I'm particularly glad I had occasion to take pictures of it. The last photo is my favourite. So, on to the review! Try the World is a subscription service which sends members a beautiful box with a specific cultural theme every two months. They work with local experts to bring the best gourmet foods and suggestions of music, movies and culture tips from each country right to your doorstep. We were sent the Japan box. Here are some photos of us enjoying some of what was inside. 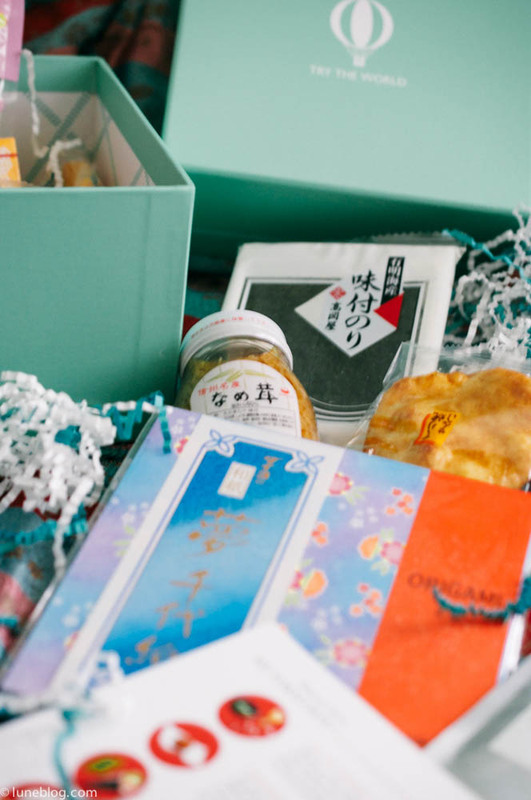 The box contained a Culture Guide to Japan and an illustrated card which detailed what each food item was. There was also a cute package of origami paper to craft with along with two sets of chopsticks. A few of the food items required preparation, but the majority were ready to enjoy. Because the kids were so excited to taste test, we got straight to business. I read from the booklet and food card, telling the kids about each item before they opened it. The tasting was really fun. We enjoy the standard westernized Japanese cuisine (sushi - yum) but it's interesting how different snack foods are! I hardly got any photos of Luke trying out the savoury ones like the Maruhiko Senbei crackers. He spit them out so fast that I wasn't fast enough to photograph it. Both kids were such good sports though, trying a bit of everything even if it was made of seaweed or tasted like wasabi when you expected it to taste sweet. At the end, I asked them to pick a "winner". Not surprisingly, the sweets won favour. 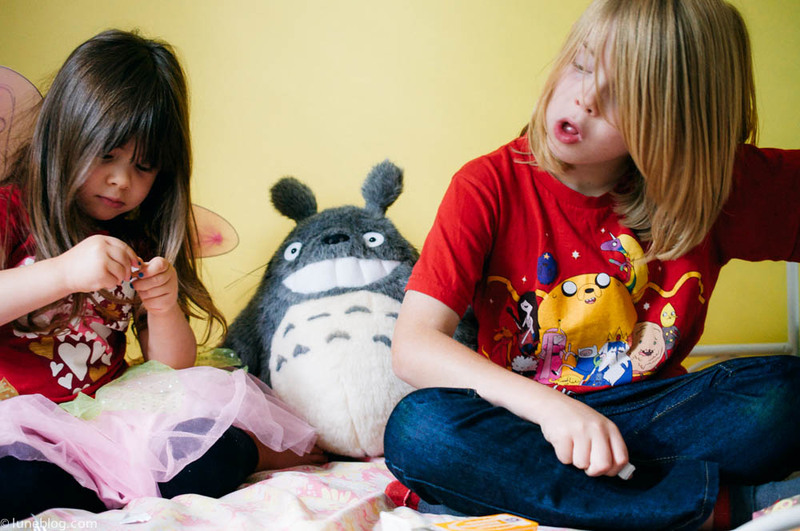 Luke picked Konpeito sugar candy (Eve's close second) and Eve chose Morinaga milk caramel candy as her favourite. The remainder I split up into things for me to try, like the Aoi Matcha Blueberry tea and Misuzu mushroom condiment, and things Luke could bring for his friends to try at school. We also enjoyed reading the included Culture Guide and got a kick out of seeing My Neighbour Totoro (1988) listed under classic movies. We know all about him and other Miyazaki films. Big fans! All told, I think Try the World boxes are excellent to share with your kids or a group of friends. It's very entertaining passing treats around for everyone to try. There's also some items that can be enjoyed at a leisurely pace or in your own cooking. Light reading material helps educate you about each product, it's origin and history. You'll find the packaging is very well thought out, and presented in an exciting way. If you make a point of putting aside time to make an event of opening and trying out your box, I think you'll have as much fun as we did. And, we still have a lot of tea to drink and origami to make, so the fun's not over yet.